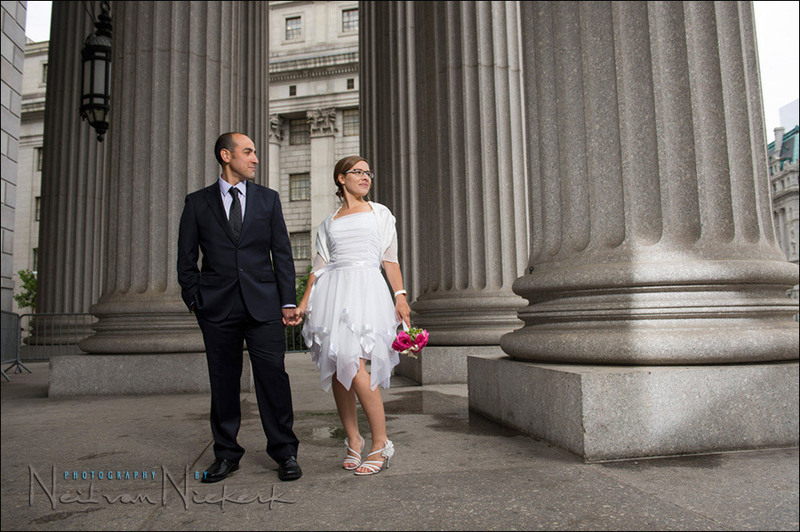 I had the pleasure of photographing Rebecca and Max’s elopement wedding in New York. They’re both from Denmark. (Actually, Max is from Spain originally.) 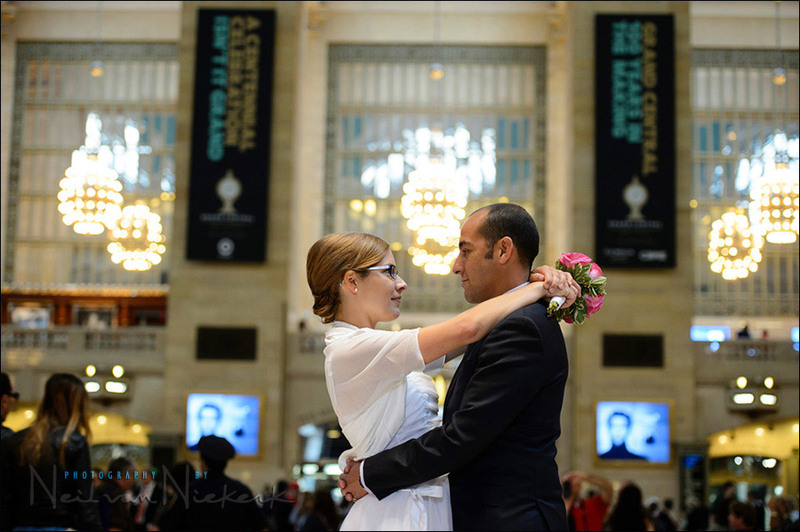 They both planned to get married in New York while over on a trip here. 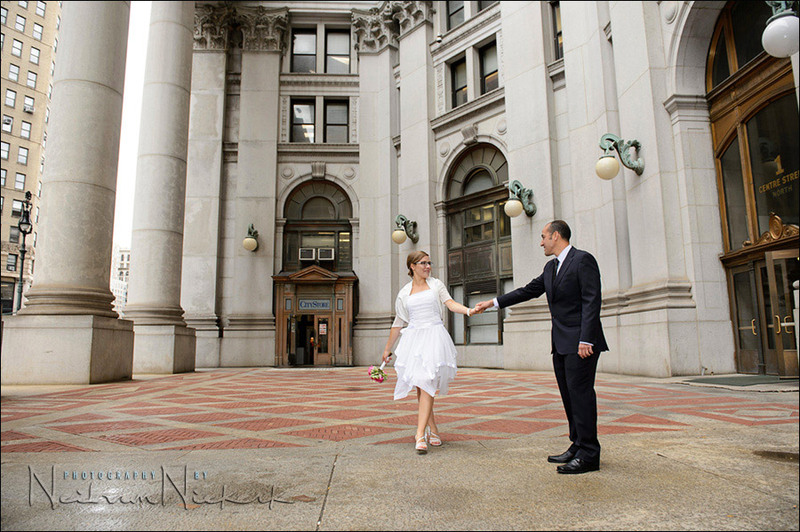 I met up with them at City Hall on the day, where I was the witness to their wedding ceremony. That’s quite an honor too. 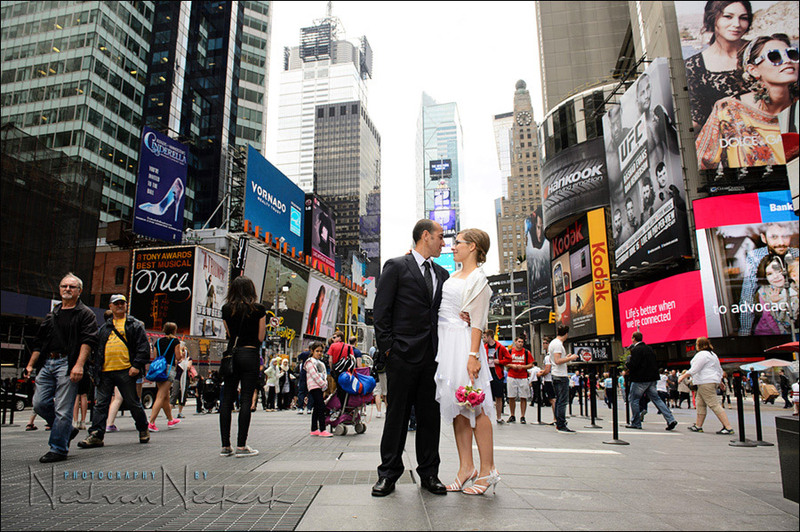 Then, after the ceremony, we ventured out into Manhattan for an extended photo session. And this is where there is a certain balance that I need to maintain. If I have a specific style in photographing on-location portraits, it is one of simplicity. 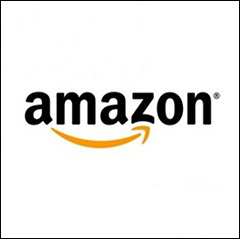 – by using a wide aperture on a tele-zoom for shallow depth-of-field. Great. This works well when the area that we’re photographing our subject in, is just something to have as an interesting, but non-specific background. The background might even be defocused so you can’t really tell where it was. Now, when the location is very much part of what is happening, then as a photographer we need to definitely include the location as part of a “character” in this story. I recently did it with the father and son portrait in Times Square. And so it is with a wedding taking place in New York, where New York was very specifically chosen as an exotic destination. The photographs of Rebecca and Max had to show a wide range – from the more specifically portrait-like images, to photos which show the city they are in. But I also wanted to avoid a cookie-cutter touristy thing where we move from landmark to landmark and just have them pose in front of things and buildings. I still wanted to show how they interact with each other. 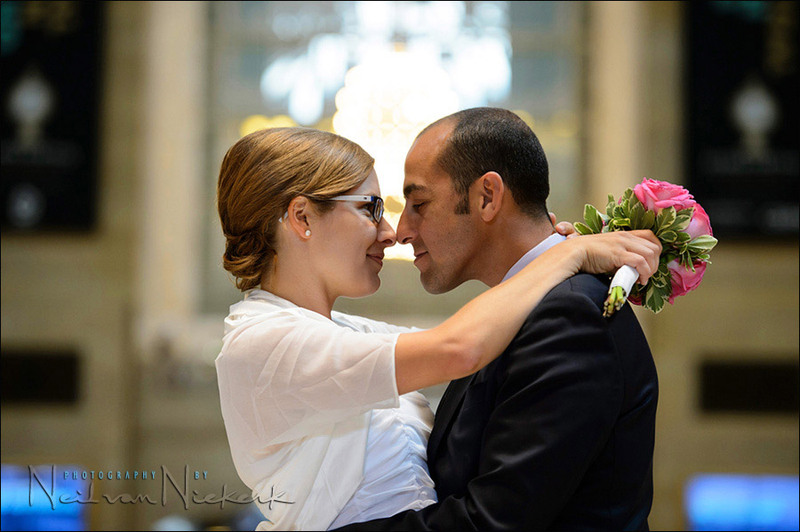 For me, wedding photography, and photography of couples, should be about how they interact with each other. It should reveal something very much *them* along the way. 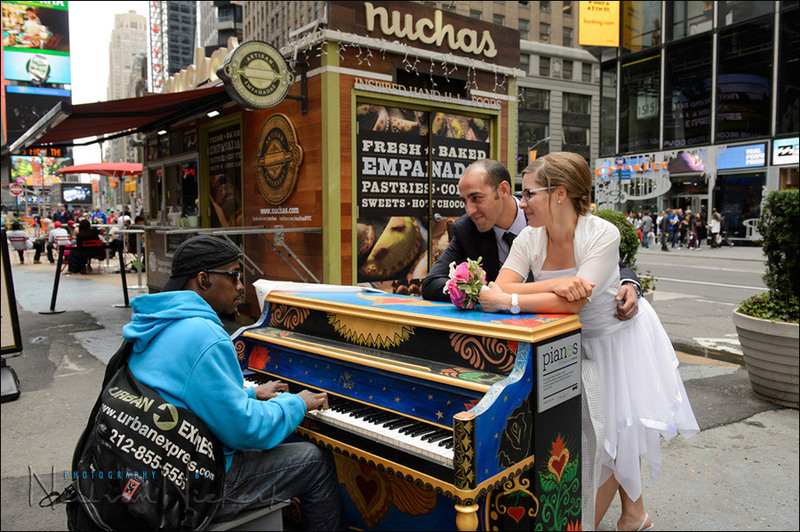 So there’s the challenge – to take photographs of the couple in Manhattan, and have the range of photos – from elegantly simple portraits, all the way to showing them against the backdrop of the busy city. And yet, not have that same busy-ness intruding, and distracting attention away from them when their family and friends look at the photos. 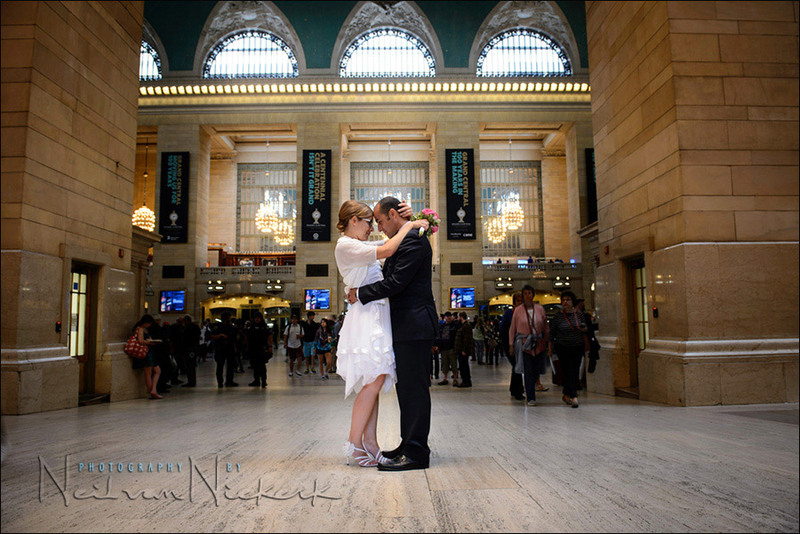 For these two images in Grand Central Terminal, I wanted to use a slow shutter speed to melt most of the people away. Without a tripod, a 2-second expose was about the most I would risk, just resting my camera against a railing. The image at the top was shot at 2-seconds @ f/8 @ 100 ISO. This second (vertical image) was shot at /14 @ f/4 @ 100 ISO, as a prior test. I set my camera on self-timer mode to make sure that I wasn’t nudging the camera in tripping the shutter. The weird thing was to see how people would walk right up to them and photograph them. One guy walked up to them within a few feet, and blitzed them with flash, and then walked away, checking his camera’s preview. Seeing this, it just made me realize what rudeness it is to reducing other couple as objects. There’s a longer conversation here, I’m sure. Anyway, back to the photos … I had to shoot a number of photos to get the foreground clear. Even for the image at the top, I had to paste in part of the right-hand side floor onto the left-hand side floor to remove someone who stood there for a while, immobile. Summary: a slow shutter speed of 2-seconds, and even a dash of Photoshop helped here. Setting the camera on a railing, and using self-timer helped in reducing camera movement. 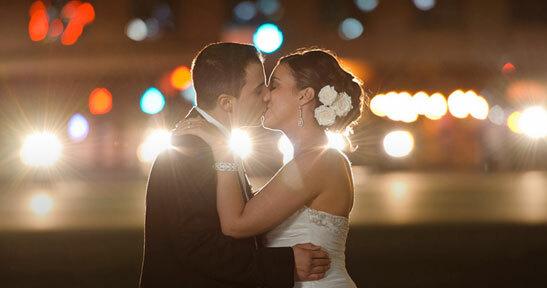 Moving around the corner to one of the entrances, I wanted to use the brighter available light to make them stand out. The wider angle also helped in reducing the size of people in the background. I had zoomed to 24mm for the series of images here. I also shot 1/4 second hand-held and had to lock my elbows into my sides to steady the camera. And controlling my breathing also helped in steadying myself. The slower shutter speed was to help blur anyone moving right past us. In the end, I chose the photos where there were no people directly near us. With the direct-out-of-camera image, the people in the background were still too bright. 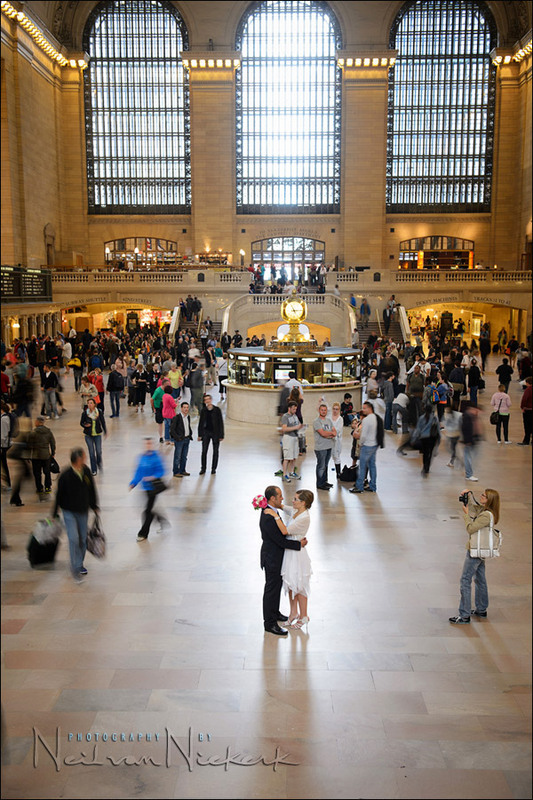 I brought the exposure up on the couple, as well as the windows at the top, with a local correction brush on the RAW file. Similarly, I pushed down the exposure of the people in the background to mute them. Even then, the women clustering in the group on the right, had brightly colored clothing. I muted the colors by de-saturating that part of the image. Note the viewpoint. I was shooting from low down. This had the dual effect of making the interesting background larger, and making the foreground smaller. 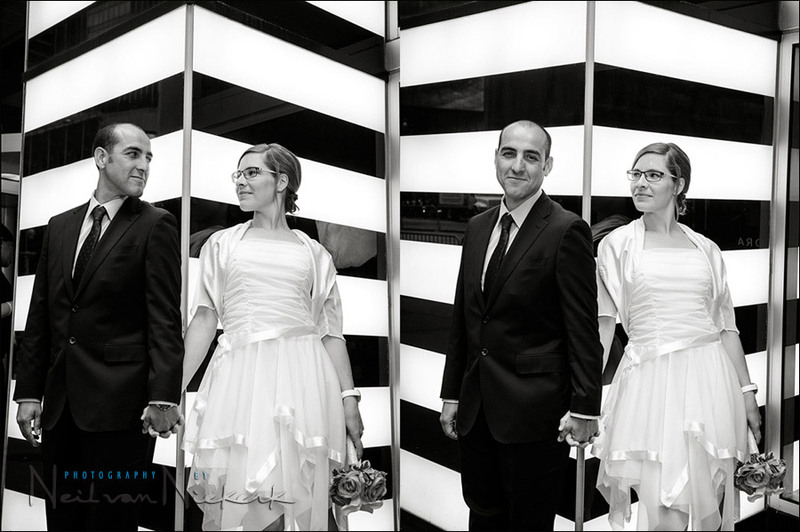 Simultaneously this helped in making the foreground dynamic, with the stripes pulling your eye towards the couple. If I had shot from higher up, the floor would’ve been too large, and that specific perspective would be gone. Summary: a bit of judicious darkening and brightening parts of the photo, and de-saturing distracting colors. The composition was also a key here. From that same spot, I used a longer lens. Still shooting from a low viewpoint, the people’s heads were now just shapes and patterns on the bottom part of the photo. They become a base now for the image. The wide aperture on a longer focal length (70mm) helped to make them more indistinct. For any setup or pose, it makes good sense to use a few moments to shoot vertically and horizontally. Wide and tight. Change the composition. It’s a rare decision to only use one single composition when you have the opportunity to work the subject and scene a little bit. Summary: shoot tight and frame in a way that minimizes clutter. Shallow depth-of-field with a longer focal length, also helps. With architecture this imposing, even a wide-angle photo can be a simple composition. I asked them to walk towards me for a part of the block. Well, you have to be really jaded not to not be taken by the architecture of Manhattan. I love the symmetry of the way they looked around them. They are also central in the frame, yet the background has an asymmetry to it. Of the sequence of images here, I liked this one the best since the group of people were distant in the background. They make the place not look deserted, yet, they are just part of the background. Then, when there is a place which only has sporadic foot traffic, use the opportunity. Off-camera flash in a softbox cleaned up the top-heavy light here. Summary: dynamic compositions with wide-angles help give a sense of place and context. Avoid distracting elements. Then, when you find an interesting background, shoot tight to avoid distracting elements. I had to clean up a few reflections from the black areas. For this next image in a location I’ve used before, I just knew already that a B&W version would be striking. 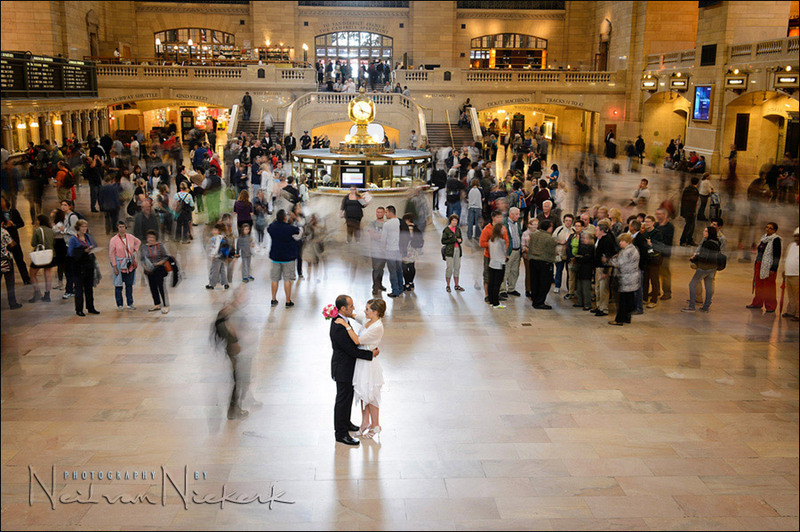 The magic recipe of using a longer focal length to help isolate your subjects against a pleasing background. And just for extra measure, there’s the pull-back shot to show my daughter, Janine, helping me out with the off-camera flash during this entire photo session in New York. With all that said about clean compositions, to get a sense of how busy New York is, you need to also embrace the clutter. With this wide-angle view, note again that I shot from a low viewpoint so that the bare foreground doesn’t take up half of the image. We mostly just want interesting people and stuff. What I wanted to show with this selection of images, is the constantly changing thought-process with every scene. 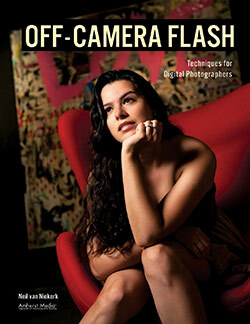 Different focal lengths; different compositions; available light, or off-camera flash. 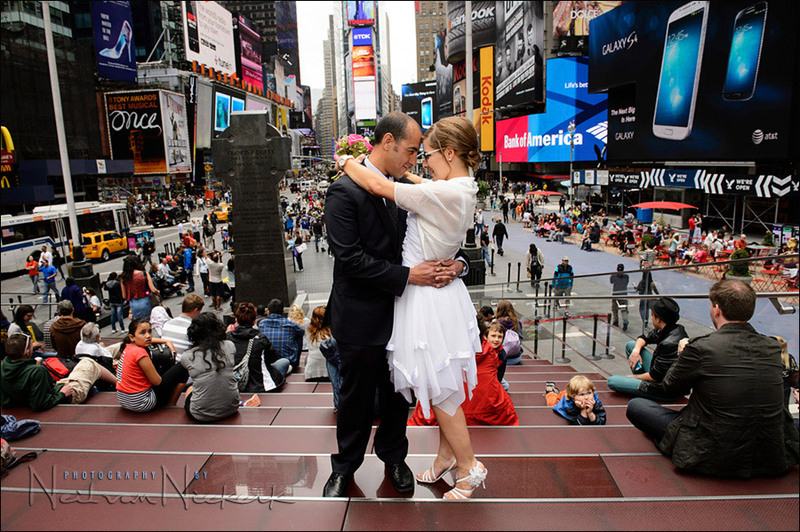 With on-location photo sessions, it is rarely just one way of working, or one way of doing things. 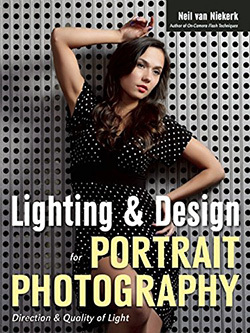 We should freely use as many aspects of photography technique as we need, in order to present our clients with a variety in the images. Yet, all with a coherent style. Great post and very useful given that what I do is most likely to expand to these areas before long. I have to ask one question though – even though I *might* know the answer – it might assist others, but why on the image where the couple are outside looking, in opposite directions did you chose 800 ISO (camera settings: 1/1000 @ f/4 @ 800 ISO – 50mm focal length) if your shutter speed was 1/1000th? Other than good sharpness for any motion I am wondering why? ..I just realized after reading the next post how ‘lazy’ I am in not determining what the equivalent exposure would be at say 400 ISO or say 1/250th… off to do some math… but, the original question is valid, I think! Jon, you answered your own question. That’s the exact and only reason why I shot at a high shutter speed there. Excellent Neil – not just technically good, but good vision! Rudy, as I said, there’s a larger topic here. Somewhere inbetween street photography, (where you observe people interact with their environment), and taking snaps of New York while exploring, there’s a range of experiences here. Hopefully we’re all respectful of people, even though they are in a public place. But there are also times when it is just intrusive in how photographers think they have a right to do as they please. What I found surprising about this specific guy was that the couple was “isolated” … there was no one near them … yet, he saw them there and just strode right up to them, lifted his camera and fired his flash as he took the shot. Then he ambled away. His manner, even in a public place, was intrusive. Of course, there are blurred lines here – shades of grey – about what is good behavior on the part of a photographer. I’m ambivalent about much of it. 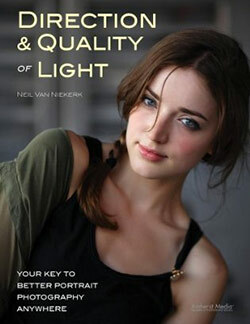 Great blog post explaining your thinking process in lighting and composition! thanks for explaining further. I do not think there is one right answer here but I do see and understand your point. Sounds like the man did indeed overstep his bounds and sounds like he needs a good zoom lens :) In certain respects, it is much like guest photographers at weddings getting in the way (intentionally or otherwise and yes, I am referring to your post about the “nice” man that blocked a few of your shots at a wedding) and being obtrusive. 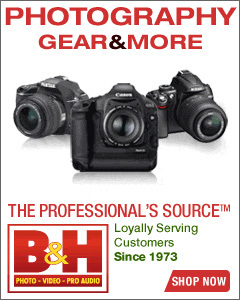 On a side note, SMUGMUG (I know you partner with ZENFOLIO) is doing a huge photo-walk on June 29th if I recall. I am sure some of your fans will be there. Are you walking with the crowd? I’ll bet the couple was thrilled with the wide variety of shots that you (and your lovely daughter) were able to provide! 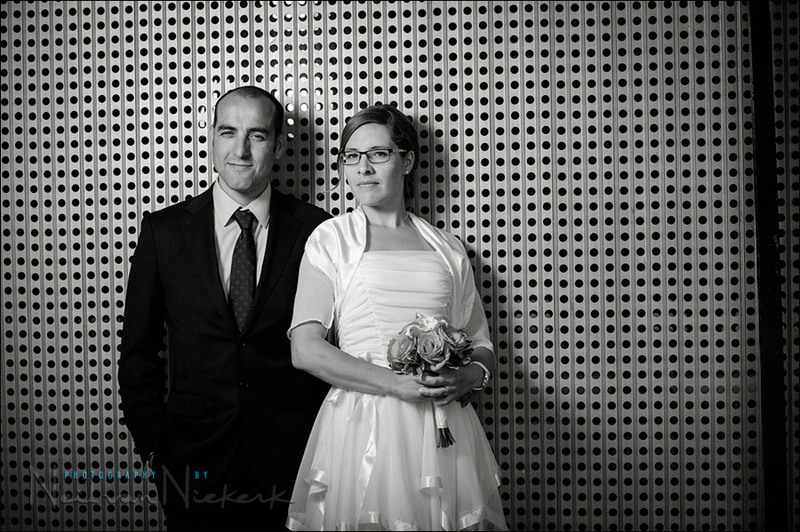 Was it TTL in the softbox? Mary-Claire … I shot with manual flash here, via the PocketWizard TT5, and AC3 Controller on the camera. And there’s still some people out there that say you don’t require stabilisation with wide angle lenses! I love the photo tips you’ve outlined here. 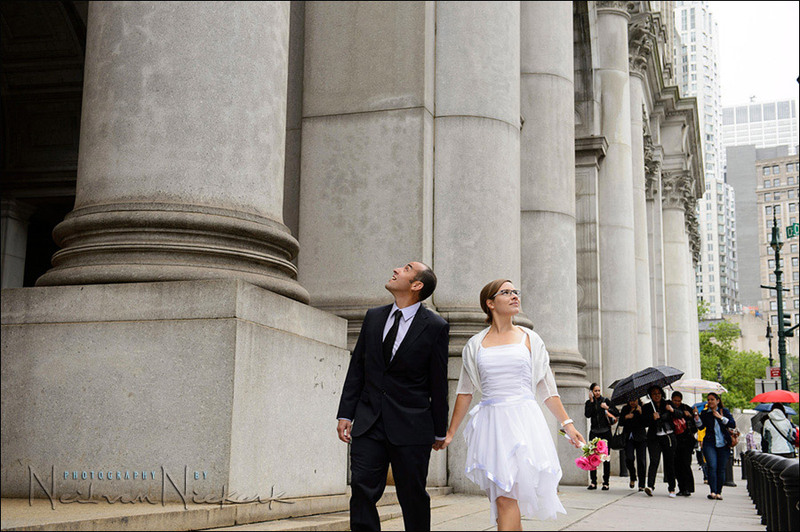 A truly great rundown of a wedding photography session. You rock boet. Any plans for a Cape Town class. I love how, although the background was ‘busy’ in a lot of the shots, you still managed to isolate the couple which gave the feel they were in their own little world (probably were then anyway) but still conveyed the street/PJ style of images. An excellent set of photos and accompanying explanation of the rationale and techniques used – its very, very informative. Thank you. I don’t shoot weddings myself, but I can take a lot from this article and use it in my own photography projects – mainly travel shots for personal work. I often use low angles to add that extra bit of difference. In terms of post processing the above images, there is a wonderful ‘illuminosity’ about them, can you share with us how you achieved that please. David .. nothing really more than adjusting the Contrast and Vibrance, and a few other of the sliders, as I adjust the RAW files. 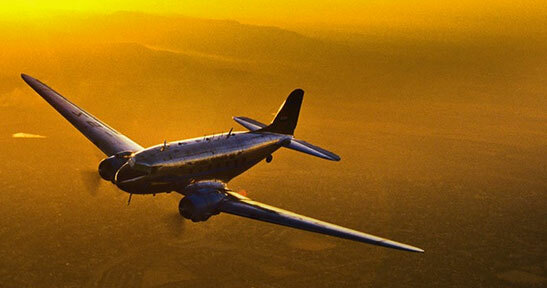 Then, sometimes I use a soft light layer in Photoshop to add more punch to images. 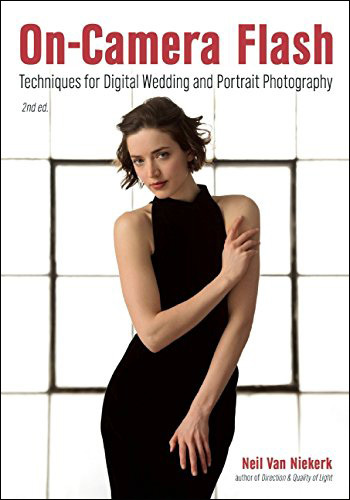 Fantastic read, I’ve been thinking of doing something similar for a first dance, with the guests dancing around them all blurred. I’m assuming you were using HSS on the shot on the bridge where you have the group of photos where you did the pull back showing the position of your daughter with flash. Are you full power considering the distance, while shooting at 1/640???? Also, thanks for everything you provide. Cheers. Yup, I was in HSS mode with that high shutter speed. As far as I remember, I was at full manual power here. I checked the result on my camera’s preview, and liked it. Essentially, I just needed fill-flash there.